It is one of the worst feelings in the world. It is that sinking feeling that starts in the pit of your stomach and affects your entire body and brain when you see your new smartphone or tablet kissing the concrete floor under your feet. Luckily, in this day and age, most of our beloved devices are made strong enough to withstand most collisions with the floor, but that doesn't stop companies like Square Trade from trying to sell you an extended warranty for your new BlackBerry PlayBook. Square Trade dropped a BlackBerry PlayBook a number of times to prove how much you really might need an extended warranty. After just a couple of drops on the ole pavement, the PlayBook was looking pretty beaten up. A couple more falls from waist high, and the glass on the PlayBook was shattered. Sure, you might tell yourself that this won't happen to you, but everyone ends up watching in slow motion as a favorite device hits the deck. At the end of the video, Square Trade tells you how you can win one of two free extended warranties that they are giving away for certain devices, so you might want to have a pen and paper handy. This makes me sad :c expected better from blackberry. I thought it did pretty well. I dropped an ipad from less height than this on to carpet and there was enough body twist to dislodge and crack the front glass..... Now I've got the playbook 64Gb coming, first thing I'll be doing is getting Otterbox like protection for it!! "Probably 3 or 4 times bigger than my iPhone" "They said this is just a pound but it kind of feels like a block, pretty heavy" The moment I heard that, I already knew this guy was a tool. I'm obviously going to compare a tablet to a phone and drop that waist high to see if it would break. Worst part was he doesn't even drop his iPhone, so what's to compare? Please tell me they tried this on an iPad 2 first. Sorry but this has fanboy written all over it. Want to see if the ipad gonna pass this test or not ? well my friend's ipad fell on its face from a little above knee height and the front glass had a huge ugly cracked scar to show all along its length!..and it wasnt even on the concrete!! Does anyone know if the playbook has gorilla glass? yep, its gorilla glass... But even gorilla glass ain't gonna protect you from a 1.2m fall face first onto concrete! Seriously? How dumb do you have to be to drop your tablet. Your expensive tablet. If I had one I would be so careful it would never meet the ground unless I was setting it on the ground ontop of a cloth. What did you really think would happen if you dropped a heavy tablet on the ground? It would magically show no scratches or dings? The Playbook actually fared better than the Ipad II and other tablets that these same people drop tested. 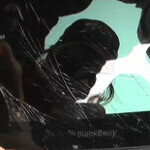 The Playbook took three drops before the screen shattered, the Ipad II completely shattered with just one drop.